string(1202) "Resource Centre > Uncategorized > Levi Strauss & Co. and Hannes & Mauritz AB Announce Global Ban on Sandblasting"
As a commitment to the health and safety of workers across the apparel industry, Levi Strauss & Co. and Hennes & Mauritz AB (H&M) today announced plans to implement a global ban on sandblasting in all of their future product lines. The two companies are encouraging others to join this ban in a move toward eliminating sandblasting as an industry practice. Sandblasting is one of a number of finishing techniques used to create a worn look for denim and other apparel. 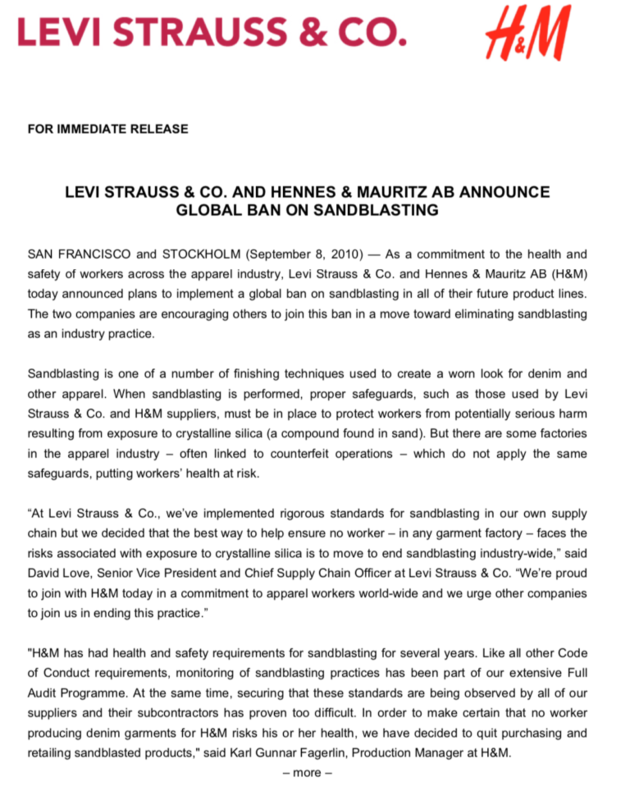 When sandblasting is performed, proper safeguards, such as those used by Levi Strauss & Co. and H&M suppliers, must be in place to protect workers from potentially serious harm resulting from exposure to crystalline silica (a compound found in sand). But there are some factories in the apparel industry – often linked to counterfeit operations – which do not apply the same safeguards, putting workers’ health at risk.